When suffering from hemorrhoids the one thing you want to know is what hemorrhoids cure will give you the fastest relief from the pain and irritation you are experiencing. The answer to this is not so clear cut because people respond to treatments differently and what works for one person may not work for another. There are a lot of treatment for hemorrhoids available but you must try a variety of methods to find which hemorrhoids cure is best for you. Ice – Applying ice directly to the hemorrhoid will soothe the area and provide immediate relief form some of the pain. Ice is also an effective way to reduce the swelling in the area. Hemorrhoid Creams – While they may not necessarily cure the problem, hemorrhoid cream will provide immediate relief from the itching and irritation you are experiencing. Warm Sitz Baths – This is a very effective and sometimes overlooked hemorrhoid cure. Indulging in a warm sitz bath for 15 to 20 minute two or three times a day will work wonders on healing your hemorrhoid. The warm water is very soothing to the area and is also instrumental in shrinking the size of the hemorrhoid. In addition to the above hemorrhoid treatments, it would also be very helpful if you drink 8 glasses of water daily and add foods to your diet that are high in fiber, such as fruits, vegetables, and whole grains. High fiber foods and water will help to keep you from getting constipated. Constipation is one of the major reasons for hemorrhoid flair ups. 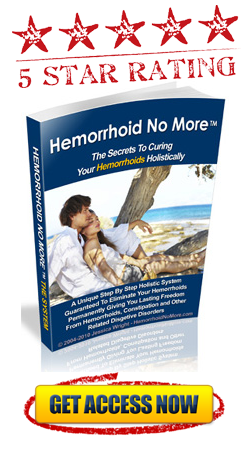 If you have tried all of the hemorrhoid cures above and your hemorrhoids have not improved or continue to get worse, it is imperative that you seek medical attention as surgery may be necessary to rectify the problem.